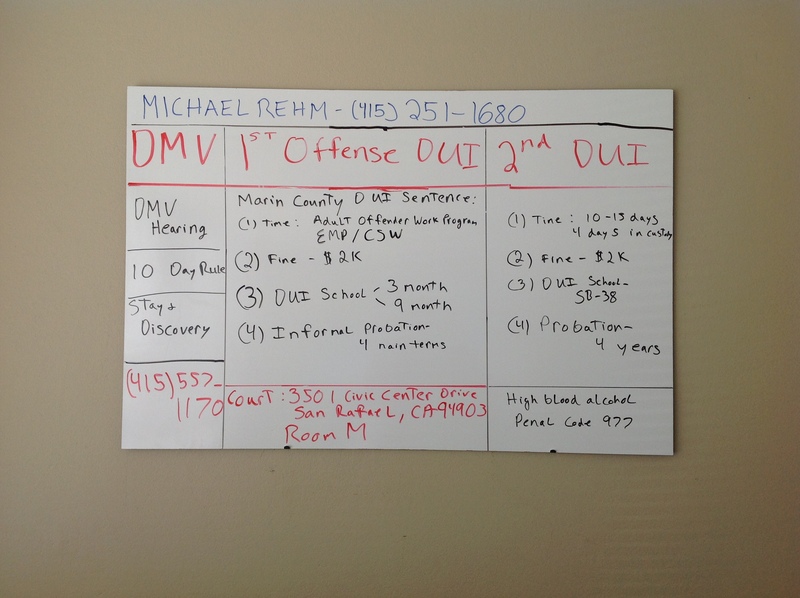 I decided to make a video going over the process in DUI Court in Marin County. The transcript is below as well as the video and a picture of the whiteboard used in the video. I hope it helps. Hi. My name is Michael Rehm. I’m a DUI defense attorney. This video today is an informational video designed to give you some sense of what to expect in court if you’re facing a first offense DUI, and what you can do right now, to do as much damage control as possible, and to make sure that you’re going on the right track from this point forward. Specifically, this video is dealing with Marin County, California. For those of you that are facing a first or second offense DUI in Marin County, this is applicable to your case. It’s not a guarantee as to any kind of a result. I’m not implying any kind of result. This just is based on my personal experience, and it’s based on the cases that I have handled specifically in Marin County, California. First off, you have to deal with the DMV. If you’ve been arrested for a DUI, whether it be a first or second offense, you should have been given a pink piece of paper that is your temporary driver’s license. If you read that, it specifically says this license is valid for the next 30 days. But if you read in the fine print, you’re going to see what’s called the ten-day rule. The ten-day rule states that if you set a hearing within ten days of the arrest, then your license is valid through the outcome of the hearing, so you no longer are going to lose your license after 30 days from the day of the arrest. You get an opportunity to have a DMV hearing. At the DMV hearing, you have an opportunity to contest the DUI amongst other things. Now, this is a particular useful option. In any kind of a DUI case, if you’re not going to get an attorney, you should do it yourself. If you are going to get myself or any other attorney, we’ll obviously do it for you. But how you set the DMV hearing is this. First of all, you just have to call. If you’ve been arrested in Marin County for a DUI, you’re going to call the San Francisco Driver’s Safety Office of the DMV. Their direct number is (415) 557-1170. When you call, ideally you can have the temporary, the pink piece of paper, temporary driver’s license on you because they’re going to need some information off that. But you have to call within the ten days, and you’re going to tell them that you want to contest everything. You’re going to say you were arrested for a DUI and you want to set up your DMV hearing. They’ll know exactly what you’re talking about. You want to contest everything because they might ask you what specifically are you contesting. Just say you’re contesting everything. You’re going to ask for two things: a stay and discovery. A stay means that your license is not going to be suspended after 30 days, and it’s going to remain valid, and the suspension is going to be stayed pending the outcome of the hearing. Discovery is the evidence in the case: the police report, any breathalyzer results, blood test results. They’ll know; once again, they’ll know exactly what you’re talking about. Where this can become, even with a lawyer, without a lawyer, extremely beneficial is that normally in a criminal case, a DUI case where no hearing was set, you don’t have an opportunity to request the evidence until the first day of court. When you set up the hearing and you request a stay and discovery, or even just a discovery, you get the police report, blood test, breathalyzer results, whatever, whatever the evidence you’re needing depending on your case. You get it as soon as the DMV gets it, which is generally before the first court date. So you get an opportunity to actually analyze all the evidence that the other side has before you walk in there, which can obviously be beneficial. The other issue is on the stay. 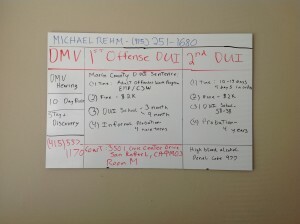 Many times the DMV will need to continue or delay the DMV hearing while you’re in court. Sometimes your defense attorney, myself or whoever might be handling your case, will need to delay it as well because of a court conflict or outstanding evidence, something to that extent. While that hearing is being delayed, you continue to drive. Many times you’ll have a situation where, while court is going on, whether you’re full-blown fighting the case or not, it can go on for two, three, four, five, six months or longer. And so for a lot of my clients, it’s ideal if they can continue to drive in the meantime. That’s not always a certainty, but it leaves that option at least potentially open when you have the DMV hearing set. For what it’s worth, it’s just a phone call. You just have to give them some information, and it can make a great difference later on in the case. Then if you do have a case later on as well where you’re really contesting and you want to cross-examine the arresting officer or cross-examine any kind of witnesses, you have an opportunity to do that actually at the DMV hearing outside of the presence of the district attorney or the court. That testimony is under penalty of perjury, so you could actually get a full-blown glimpse of what the witnesses in your case are going to be testifying to outside of the presence of the district attorney and court under penalty of perjury in advance of any kind of a trial or motion or anything to that extent. It takes no time at all, and later on it can be especially valuable, so I can’t emphasize that enough. If you’re going to hire an attorney, you should try and do it within ten days of an arrest. And if you’re not going to hire an attorney or you’re going to hire an attorney after the ten days, just set the hearing on your own. Next, we have court. Marin County Court is at 3501 Civic Center Drive, San Rafael, CA 94903. The first court date in Marin, there’s not a district attorney there. There is not even a judge there on a misdemeanor DUI case. You simply walk in, and you get read what they call the offer sheet. If you want an opportunity to negotiate, it basically is set for a further court date. It’s a court date that you have to select within 45 days of the initial court date. Now, I go for all my clients. Any attorney you hire is going to go for you. If you don’t hire an attorney, you go. You set. It’s not difficult, but don’t think that there’s going to be major negotiations or the officers are going to be present or anything to that extent at the very first court date. It’s a very informal court date. But the next court date after that is where you actually, especially if you’re an attorney, you get an opportunity to negotiate with the district attorney at that point. Specifically, that court date is going to be in Room M. All DUIs right now, at least misdemeanor level DUIs, are being handled in Room M of the Marin County Court. The judge there is a good judge. He’s extremely fair. He’ll actually listen to what’s going on in the case. He’ll take everyone’s individual circumstances into account. You have a good judge, at a minimum, in that department. And the District Attorneys Office is somewhat fair as well. They’re pretty good about getting you the evidence, whereas other countries sometimes they drag their feet on actually getting you the evidence. You have to call multiple times and so forth. But the way it basically works is, the first court date, no one is really going to be there. They’re going to give you a blanket offer. The case is continued for within 45 days. What I generally do is, in between the time of the first court date and the second court date, the district attorney will let you hold a phone conference with him and you can actually negotiate at that point, or you can just say, “Look. We’re still missing this piece of evidence, this piece of evidence, this piece of evidence.” Ideally you can get everything by the court date or, if not at that court date, the next court date and so on. Don’t have too much anxiety about the first court date. It’s not action packed. It’s actually anticlimactic for most people. If you actually get convicted of a first offense DUI in Marin, as I stated this isn’t a guarantee. This is just based on my experience for the clients that I’ve represented in Marin County. You’re basically looking at four things for a first and a second. You’re looking at time, a fine, DUI school, and informal probation. Now, as far as the time, that means custody. A lot of websites talk about how there’s a minimum of 48 hours in custody or a certain amount of time in custody. Technically that’s true. But what that actually means is that you’re going to get sentenced potentially to time, to custody, and you’re going to get a right to serve that time on alternative sentencing, which in Marin County it’s called The Adult Offender Work Program. If you’re not eligible for that, and you have more than 60 days–I believe the number is because there’s a minimum amount–you can potentially get ankle monitoring, EMP. More than likely in the first offence, you just do general community service at a nonprofit, and they have a list of them. In my experience on most first offense cases in Marin County, you’re not going to have to do The Adult Offender Work Program or the EMP. Generally, you might not have to do any sort of time. Generally, it can be stayed or you can get credit for time served, and you might have to do some sort of community service. That is generally the extent of it. Now, that’s just if you’re on kind of a standard DUI where the driving is not outrageous, there’s no high blood alcohol, something to that extent. Marin is pretty lenient in comparison to other counties at least. The fine is around $2,000. That is, for the most part, nonnegotiable. You’re going to get an opportunity obviously to make payments, and they’ll allow you to set up a payment schedule right then and there of how much you want to pay a month and when you want to start payments. The DUI school is going to be ordered. Now here’s the thing with that. Even if it wasn’t ordered, in order to get your license back if you’re convicted of a DUI, the California DMV is going to require that you complete a DUI school. The court is going to order it, and they’re going to order either a three- or a nine-month school. The difference between the two is going to be on blood alcohol. If you’re a 0.20 and above, you’re going to be ordered to do the nine-month school. If you’re a 0.19 and under, you’re going to be ordered to do the three-month school. Just so you realize, just because a blood test comes out at a 0.2-something doesn’t mean that’s actually what it was at the time of driving. So a lot of times this DUI school number and what the blood alcohol level actually is stipulated to in court is negotiable. If you’re way up there, if you’re above a 0.25, something to that extent, it’s going to be hard to get the district attorney to agree to stipulate to a 0.19. But if you’re around that area, it’s not unheard of to get an agreement where they stipulate to a lower blood alcohol level than is actually shown based on that theory right there that I just discussed as far as the rising blood alcohol, and you get the three-month program as opposed to the nine-month program. Keep in mind that’s negotiable. The fines, for the most part, are not. You’re going to get what’s called informal probation. Now, you’re not going to have a probation officer or anything like that. It’s not like you’ve been convicted of a felony. A DUI, a first offense DUI and a second offense DUI is just a misdemeanor. But what it is going to come with is four terms, and they’re pretty basic. First, you’re going to get what’s called obey all laws. It’s a catchall provision. Now, in order to actually violate that term, from what I’ve seen, you’re going to at least have to get arrested or be convicted for another misdemeanor offense or higher, obviously. An infraction, and by infraction I mean a speeding ticket, stop sign, something to that extent, technically could violate your probation in theory. The district attorney could actually make an argument, but I’ve never seen that occur. Just rest assured, I know it’s scary having that obey all laws provision, but you generally have to get in trouble again for another misdemeanor offense. The rest of them all kind of are specifically related to alcohol. There’s a zero tolerance. You can’t really drive with a 0.01 or more in your system, so you basically can’t have any alcohol in your system when you drive for the term of probation. By the way, probation is for three years. The next one is you’re not allowed to refuse a chemical test, which you’re really not allowed to anyway without certain legal consequences that come from it. The next one is if you’re going to have a valid license, you must maintain valid auto insurance. The auto insurance you must maintain is specifically SR22 auto insurance. SR22 is simply high-risk auto insurance. For the next three years, if you don’t have it, your license is going to get suspended. I discuss this all the time with clients. It’s illegal not to have auto insurance, in general, in California. In other states, it’s illegal as well not to have auto insurance. In other states, when you don’t have auto insurance, whether you have a DUI or not, they suspend your driver’s license. It’s called a lapse in coverage suspension. California doesn’t do that. But if you’re convicted of a DUI here, in Marin County or really any other county, there is going to come with this SR22 requirement where the lapse of coverage requirement will apply to you. It’s not difficult. The insurance company, once you obtain it, is supposed to electronically forward the information to the DMV. Once you have it, you have it. You don’t necessarily have to worry about losing your license as long as you have it on file with the DMV. Like I said, it’s three years. Those are the four main terms. In summary, a first offense DUI, you’re basically looking at, for the time element of it, generally you’re looking at, in my experience at least, you’re not looking at any actual custody time, and you’re rarely, if ever, looking at any other Adult Offender Work Program time or ankle monitoring. At most, from what I’ve seen, you’re looking at some sort of community service, 24 hours, 48 hours of community service, something to that extent. The fine is around $2,000. That’s, for the most part, nonnegotiable. You can occasionally convert the fine into time, into community service hours potentially, but that’s very difficult to do as well. And the DUI school, as we discussed, either three or nine months. You’re going to have to do that anyway to get your license back. That is negotiable, in a sense, as far as determining what blood alcohol level to stipulate to, which affects what school you’re going to be ordered to do. And informal probation with the four terms, and that’s for three years. A second offense in Marin County gets a little more complicated. That’s going to be around, the time element is going to be around, 10 to 15 days. Now, follow me closely because this gets confusing for a lot of people. They’re going to want around 10 to 15 days, if not more. Out of those 10 to 15 days, they’re going to want 4 days in custody. On a second is where they start actually saying we want this person to actually do custody time. The balance, the remainder of it, whether it’s 11 or 6 days, or however much time in general, they’re going to have no opposition to The Adult Offender Work Program or potentially EMP, but they’re probably going to want the AOWP, as it’s called. Now this is not set in stone though. I have personally had clients that did not have to do the four days in custody. I’ve had clients that did have to do the four days in custody. It really just depends on the client’s kind of individual situation. In my experience, you have to have some real kind of compelling reason why you cannot do the custody, and then you’re going to have to be willing to do more than the 15 days or whatever amount of time they’re asking for. If they’re asking for 15 days and 4 days in custody and you don’t want to do in custody time, you’re going to have to have a darn good reason why you can’t do the custody time, and you’re going to have to be willing to do 25 days, potentially 20, 25, 30 days of either the AOWP or potentially the EMP. But, like I said, I believe the EMP has a minimum, so it can be difficult to do that. The fine is around the same. It’s around $2,000 and it can go up to a little bit higher, potentially, but not that much. It’s the same situation. You can set up payments, and they’ll set up a payment schedule right then and there at the court date. The DUI school changes. It’s what’s called the SB38 program. The SB38 is an 18-month program where, for the first 12 months of the program, it’s just like the first offender program. It’s going to be at least once a week for the first 12 months. After that, the last six months, you’re just going to be doing what they call face-to-face sessions. At least that’s my understanding of it. You go once a month. The first 12 months is where it’s much more intrusive. Then probation, once again it’s informal probation. You’re not going to have a probation officer or anything to that extent. It’s the same terms. Sometimes they tack on other terms as far as no alcohol, things to that extent. When I say no alcohol, I mean no alcohol in general. That’s obviously negotiable. And instead of three years, they’re going to want four years of informal probation. For the second, the real thing for the second and the real battle a lot of times, assuming you’re good for it and they got you on it, is going to be the custody time. That’s where most of the fighting takes place on these cases. Most people don’t want to do the four days in custody, understandably so, and it’s just a matter of having a compelling reason why you can’t and having an attorney that can negotiate, negotiate out of it. A couple of miscellaneous issues you should know about: high blood alcohol, that’s 0.20 or higher. We kind of already got into that. That can come with additional consequences. The nine-month school, obviously, as opposed to the three-month school. What it can do as well is it can increase the amount of time they want. First offense, it could lead to community service hours or sometimes AA in lieu of community service hours. On a second offense, it’s going to increase that 10- to 15-day number to higher. It doesn’t increase the DUI school or anything to that extent, but it does come with higher consequences and obviously makes your case more difficult to negotiate. The Penal Code 977: the Penal Code 977 is the penal code statute that allows myself or whoever you hire as an attorney to appear for you in court. Marin County is a little more strict about that than other counties. They’re not as liberal in interpreting that statute. They do order clients to appear. But the first court date, I’ve never had a client that has had to appear. I’ve always appeared for my clients at those. Most attorneys would tell you the same thing. There can be a lot of court dates that aren’t necessary for the client to appear at. There can be a lot of intervening court dates in Room M where you’re simply just getting more evidence and then continuing it again so you can get an opportunity to analyze the evidence. A client doesn’t have to come to those kinds of court dates, for the most part. The court could order you to appear, but in my experience it’s rare, especially if you explained to the court at the previous court date that you’re continuing it for a certain amount of evidence, and you’re asking that the client not have to be there if you don’t receive it by that point in time. Most courts, this judge, for the most part would be agreeable with that. I can’t obviously say what the judge for sure would do. But in my experience, most judges, in general, will be agreeable with that request. My name is Michael Rehm. My number is (415) 251-1680 for local Marin residents. If you have any questions, call me any time. But, like I said, in summary, for those of you who have anxiety about going to jail, especially on the first offense, I get that question all the time, “Am I going to have to go to jail?” I’ve never had a client go to jail on a first offense DUI, and I would be shocked if you went to jail on a first offense DUI. The main issues are kind of what you’re dealing with. What you really want to do is you want to set your DMV hearing within the ten days, or you want to get an attorney within the ten days to do it for you. This is basically what you’re going to be dealing with if you’re convicted. I’m not saying you’re going to be convicted, but if you are going to be convicted, you’re looking at around that range, in my experience, the same with the second DUI. Like I said, on the second DUI, you are facing potential custody time, and that’s where the big battle is going to be coming in. I wish you luck. I offer free consultations. You can call me any time. Good luck.